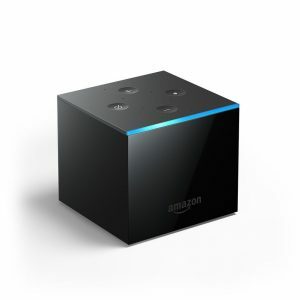 Amazon (NASDAQ: AMZN) has debuted the new Fire TV Cube, its new high-end Fire TV that you can completely control via Amazon’s Alexa voice assistant. The Fire TV Cube will begin shipping on June 21 and costs $119. Amazon Prime members that pre-order the device on June 7 or June 8 will pay $89, giving them a $30 discount. The Fire TV Cube can do virtually everything an Echo speaker can. It features a blue indicator light that tells you when Alexa is listening and has mute and volume buttons positioned along the top. The Cube will let you control your various smart home devices and take advantage of Alexa’s tens of thousands of skills. However, a standalone Echo can’t control nearly as many aspects of your entertainment system as the Cube can. The Cube lets you control nearly all aspects of your television-watching experience using nothing but your voice. You can tell the Cube to turn on your TV and soundbar, open menus to scroll through lists of shows, and tune to a specific cable channel. The Cube can also show specific genres of shows and movies available through your streaming providers. There will be a few Alexa features that the Cube won’t be able to use. You won’t be able to send or receive messages, or make calls from the Cube. The company is still debating whether these types of communication features are needed on what is supposed to primarily be a streaming device. More features may be coming to the devices in the future.